By Andrew Huszar- Ex FED employee responsible for Wall Street QE – FED purchases. I can only say: I’m sorry, America. As a former Federal Reserve official, I was responsible for executing the centerpiece program of the Fed’s first plunge into the bond-buying experiment known as quantitative easing. 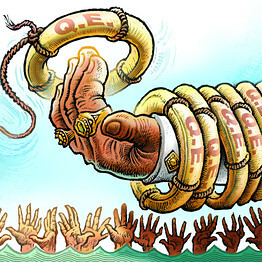 The central bank continues to spin QE as a tool for helping Main Street. But I’ve come to recognize the program for what it really is: the greatest backdoor Wall Street bailout of all time. Five years ago this month, on Black Friday, the Fed launched an unprecedented shopping spree. By that point in the financial crisis, Congress had already passed legislation, the Troubled Asset Relief Program, to halt the U.S. banking system’s free fall. Beyond Wall Street, though, the economic pain was still soaring. In the last three months of 2008 alone, almost two million Americans would lose their jobs. Mr. Huszar, a senior fellow at Rutgers Business School, is a former Morgan Stanley managing director. In 2009-10, he managed the Federal Reserve’s $1.25 trillion agency mortgage-backed security purchase program. Subscribe to http://online.wsj.com/ for more info.